I have just been wandering around the Blogosphere looking for some challenges that I can take part in as I am trying to make sure that I have plenty of ideas and challenges to keep my mo-jo going. I came across this weeks challenge and also a design team call for Stampin' for the Weekend. It was my Daughters Birthday on Thursday and at the moment she is obsessed with all things Geeky. I found this Digital stamp and knew that it would be perfect for her card.The colours I used for the card also allow it to be entered into the Stampin' for the weekend challenge this week. I hope that you like it. OMGosh this is so adorable! Love the cute image and the fabulous design and flowers. She is going to love this! Thanks for playing with us over at Loves Rubberstamps!!! 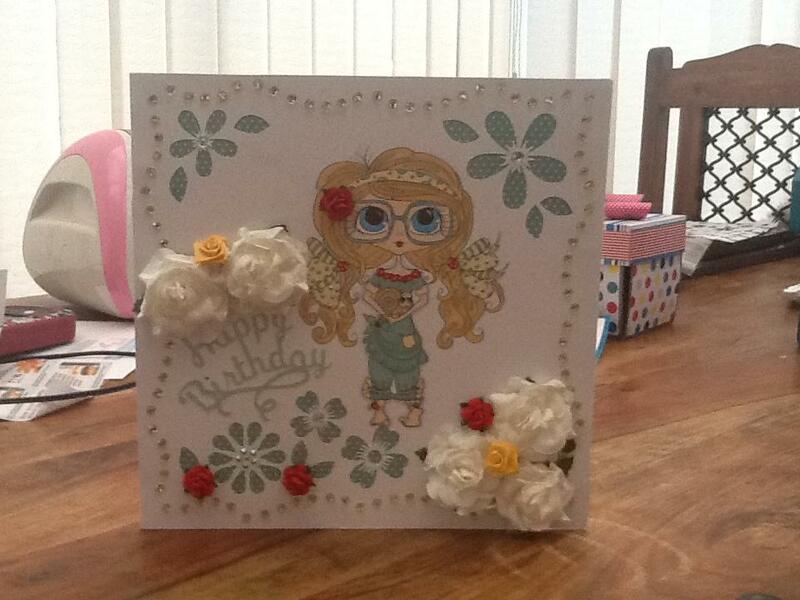 super sweet birthday card! Thanks for joining us in our Sentiment challenge this week at Loves Rubberstamps! Hope to see you again soon!